Not all hangers are alike--these Juvale Teal Velvet Hangers are packed with features that make them better than your average hangers. These hangers are extremely durable, smooth and soft to the touch, featuring notched shoulders to prevent slipping and cascading hooks to maximize closet space. Gentle curves preserve clothing and ensure clothing stays put when placed on the hangers. Velvet coat helps eliminates sliding, slippage and bumpy shoulders. Swiveling top hook is made of strong metal. Hangers measure 17.5 x 9.2 x 0.2 inches with a slim, compact profile that helps to conserve precious space in your closet. Includes a non-slip velvety finish that prevents clothing from slipping off the hanger and protects delicate garments. These shirt/pant hangers are the ultimate space savers. Velvet hangers are mainly used for: men and women suits, trousers, T-shirt, sweater, casual clothes hangers, hotel hanger and so on. The main feature of velvet hangers is the space saving result of utilizing the ultra-thin design that velvet hangers offer. Enjoy space-saving functionality with these sleek suit hangers featuring cascading hooks which allow users to hang hangers onto other hangers, maximizing the usable closet space. Velvet material keeps clothes safe and securely in place. 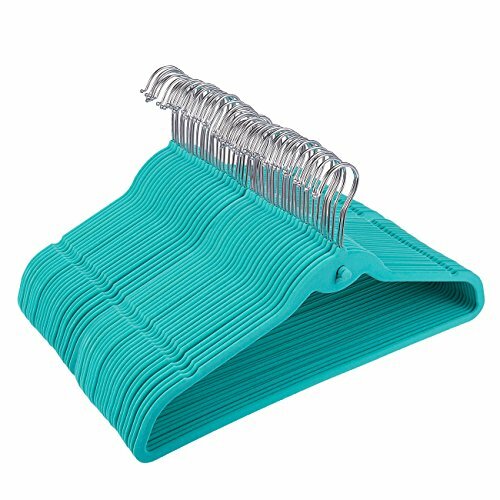 Beautiful, soft and durable, these clothes hangers are contoured to keep shirts, dresses, and pants organized. Features a 360-degree chrome, swivel rod hook to hang items easily on any closet rod or towel bar. Durable metal construction provides strength, reliability, and long-lasting beauty. Soft velvet coating is gentle on delicate garments and provides a non-slip surface that holds fabrics beautifully in place. Slim, space-saving design makes the most use of available hanging space. FEATURE-PACKED PREMIUM HANGERS: These luxurious pack of 50 Juvale Teal Velvet Hangers are smooth and soft to the touch, featuring cascading hooks to maximize space, notched shoulders to prevent slipping, an accessory bar for hanging accessories and 360 degree swiveling hook for maximum hanging convenience. SAVE SPACE: Ultra-thin space saving design along with cascading hooks allows users to hang hangers onto other hangers, maximizing the usable closet space. EXCELLENT GIFT: The premium quality and usefulness of these hangers make it the perfect gift for Christmas, birthdays, holidays or as a simple "just because" gift. DIMENSIONS: Each Hanger measures 17.5 x 9.2 x 0.2 inches.